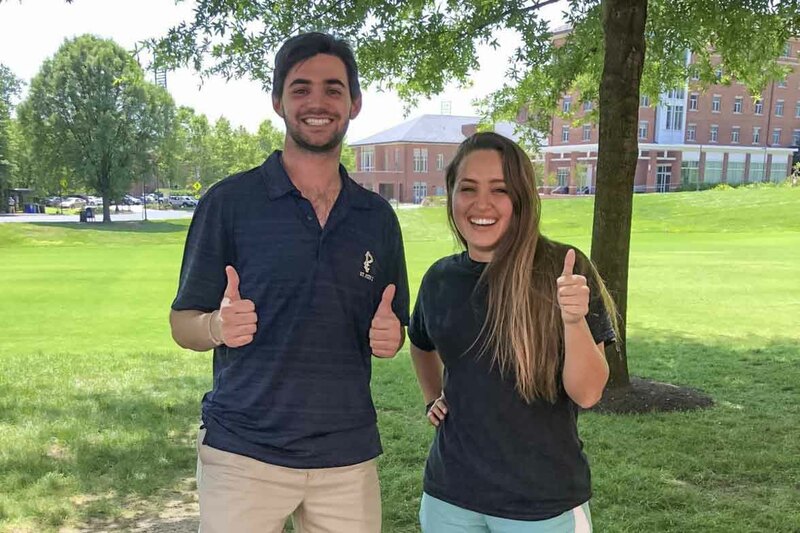 Rachel Clark and Joe Reigner smile as they recall their time in University of Virginia’s summer orientation program, when, fresh out of high school, they had no idea what to expect. Clark remembers being nervous as she took part in a wide range of “wacky” activities; Reigner remembers not wanting to do very much of anything. Reigner and Clark are both now in their second years as student leaders of summer orientation, which kicked off Thursday with the first of eight two-day sessions. Reigner, a rising third-year student from Atlanta, said he was inspired by one of his former orientation leaders, who – well after the program was over and she had no obligation to – helped him acclimate to college life. Clark, a rising fourth-year student from Northern Virginia, felt a similar pull. As you are driving down U.S. 29 and arriving at orientation for the check-in process, you will want to pull into the Emmet/Ivy Parking Garage, which is free for students and registered guests. From there, shuttles will transport you to the Student Activities Building, which is located behind Scott Stadium. If you are a student in the College of Arts & Sciences, you must bring a hard copy/printed version of courses you have pre-selected in the Student Information System, commonly known as SIS. One government-issued form of ID is required to pick up your student ID. Accepted items include a U.S. driver’s license, state-issued ID card, passport or U.S. military ID. Photocopies and school-issued IDs are not accepted. The official UVA orientation app has all sorts of useful information. Instructions for downloading it can be found here. Another app, “Campus Maps,” can be downloaded here. “The cool thing is that it recognizes building names, as opposed to just addresses,” Reigner said. “It’s likely going to be very hot and very humid, so wear comfortable summer clothes – don’t feel like you have to dress in your Sunday best – and definitely bring a water bottle,” Reigner said. Pack a gym bag and perhaps a bathing suit for some late-night fun at the Aquatics and Fitness Center. There will be pick-up basketball and volleyball, and the hot tub and pool will be open, with inner-tube water polo always a big hit. There will also be a night hike in the trails around Observatory Hill (headlamps provided), complete with ghost stories. “I went on it four times last summer and it was a blast,” Clark said. Closed-toe shoes are required. “Sometimes the dorms can get really cold, so bring a blanket or sweatshirt,” Clark said. No matter what you do, be sure to get to breakfast on time on the second day to pick up your course enrollment sheet, which has your course enrollment time on it. Reigner wishes he had been more open-minded to orientation as an incoming first-year. “It really is what you make of it,” he said. “If you’re not coming in with the attitude of ‘I have to be here,’ orientation will be a much more positive, fulfilling experience.